Gold fell to a near seven-week low Tuesday as investors turned toward the U.S. dollar and away from precious metals, other commodities and stocks. Gold for December delivery lost $16.90, or 1.0%, to $1,709.40 an ounce on the Comex in New York. The settlement price was the lowest since gold closed at $1,705.60 an ounce on September 6. Trading on the day ranged from a low of $1,705.10 to a high of $1,731.20. "As well as the technical selling, long-term investors are being forced to liquidate more of their bullish positions in precious metals in order to free up margin for their losing equity positions," MarketWatch quoted Fawad Razaqzada, technical analyst at GFT Markets. "In addition, the dollar has rallied sharply today" and weighed further on the metals "and everything else priced in bucks." U.S. stocks were pulverized Tuesday following lackluster earnings and after Moody’s downgraded five of Spain’s regional governments. The Dow tumbled 240 points for its biggest drop since June. "Gold is behaving like every other risk asset today. The negative sentiment around the Moody’s downgrades on Spain has peeled back all risk markets," Reuters quoted Jeffrey Sherman, commodities portfolio manager of DoubleLine Capital LP, which manages more than $45 billion in assets. Silver for December delivery settled to $31.793 an ounce, falling 45.9 cents or 1.4%. The white metal touched an intraday low at $31.65 and reached a high at $32.50. The PGMs were hit hardest. Platinum for January delivery dived $36.30, or 2.3%, to $1,575.60 an ounce, trading between $1,572.20 and $1,616.30. Sister metal palladium performed the worst. Palladium for December plunged $28.80, or 4.6%, to $593.85 an ounce, trading between $590.40 and $628.05. 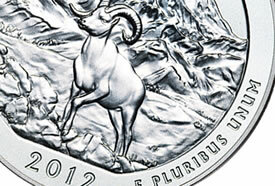 For the first time in October, sales of U.S. Mint bullion coins advanced during each of the first two days of the week. In another first for the month, each of the Mint’s American Eagle gold coins climbed with the one-half ounce or $25 denominated Gold Eagle making its inaugural October sales appearance. Sales also increased Tuesday for the newly released Denali coin, the last of the 2012-dated America the Beautiful Five Ounce Silver Bullion Coins. It debuted Monday with sales of 5,200. Can’t say as I miss Nadler around these parts. We could always count on his bearish remarks when gold pulled back in price. Just remember what he said in December 2009: “Gold has been riding a bubble of hot air.” That’s when its price was $1200 an ounce. At least we now know the source of that “hot air.” Right, Jon?